A lawyer for a death-row inmate said this page produced by the state shows that the state's execution drug expired in September. Louisiana State Penitentiary’s lethal-injection drug expired last month, a lawyer for a death-row inmate has concluded after reviewing documents provided by the state in an ongoing lawsuit. Within the pages turned over earlier this month by the Louisiana Department of Public Safety and Corrections is one page with mostly handwriting. In thick letters, it says “NEMButal” at the top. At the bottom, in smaller writing, it reads, “EXP: 9-13.” The Lens reviewed a legal filing today that included the page. “Twenty years of interpreting legal documents leads me to conclude that this terse phrase translates into “Expiration date: September 2013,” said Gary Clements, an attorney for condemned killer Christopher Sepulvado. The documents were attached to a legal filing accusing the state of not handing over all of the information on the drug. Lawyer Michael Rubenstein said the state, after failing to keep the information private in an earlier court pleading, has providing only some of the requested information. Nembutal is a trade name for pentobarbital, the drug that the Department of Corrections said in February they would use to execute Sepulvado. Until just a few weeks ago, Sepulvado had an execution date of Nov. 5. The Lens has been trying to pin down the Department of Corrections since February on the expiration date of the drug, and an attorney for the state has repeatedly said no record of the expiration date existed. Clements has been arguing in court that executing his client with expired drugs could lead to a “cruel and unusual” death, which is prohibited under the U.S. Constitution’s Eighth Amendment. The same argument has been taking place nationwide as more states have trouble securing lethal injection drugs. Texas’ supply expired in September, as did Ohio’s. States are working to find alternatives — and, in some cases, the legality of those alternatives are being questioned in state and federal courts. “As execution procedures are rapidly changing nationwide, notice and opportunity to be heard regarding new methods of execution are critical to the preservation of both condemned inmates’ due process rights and the prohibition on cruel and unusual punishment,” Clements wrote in a recent court filing. In addition to the hand-written note, the Department of Corrections gave Sepulvado’s lawyers other pieces of information that weren’t provided to The Lens in response to several public-records requests. For instance, the state turned over two documents showing that six vials of the drug were transferred from Elayn Hunt Correctional Center to the Louisiana State Penitentiary. According to the documents, the drug was transferred in April 2012. 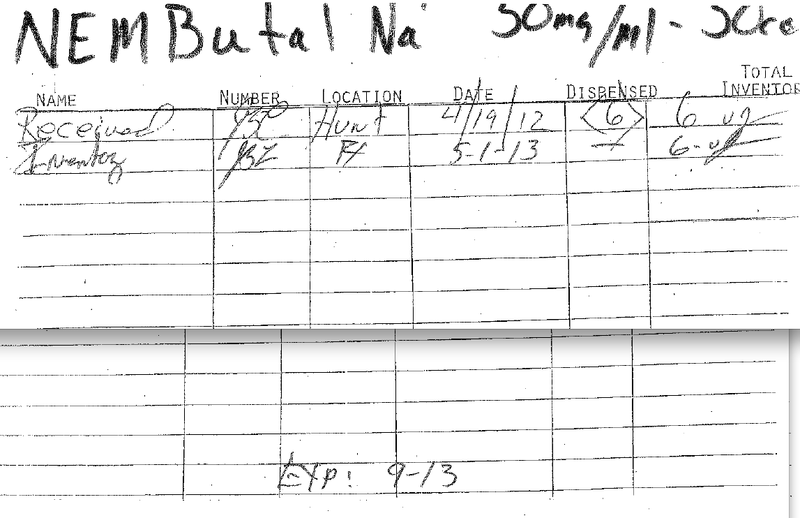 The Lens never received this drug log, despite repeated public-records requests for every record relating to pentobarbital. When The Lens specifically asked for inventories of the drug, attorney Jacqueline Wilson said that the Department is not required to keep inventory records, and she didn’t provide any. The Department of Corrections also turned over five pages of purchase records, which The Lens obtained under a public-records request earlier this year. The Lens started investigating Louisiana’s capital-punishment plans after the state said it was abandoning a three-drug cocktail used previously in lethal injections and turning topentobarbital for Sepulvado’s execution. In response, the Department of Corrections gave The Lens the purchase records, showing the drug was bought in May 2011. Those records said the drug was purchased in the form of Nembutal, a proprietary brand of pentobarbital sold by the Lundbeck pharmaceutical company. Nembutal has a long history of use — and abuse — as a tranquilizer; it was implicated in the 1962 overdose that killed movie star Marilyn Monroe. The drug has a maximum shelf life of three years, according to Lundbeck, the drug’s original manufacturer. In 2011, that company said that it would put the drug off-limits for executions. It required Akorn Inc. to honor that prohibition when it bought the rights to make the drug. Lundbeck spokeswoman Katie White said the drugs would have been shipped with labeling or packaging that included the expiration date. In the opinion of Robert Travis Scott, president of the Baton Rouge-based Public Affairs Research Council, labels on bottles or drug packaging are public records. With Nembutal on hand but no expiration records provided by the state, one possible explanation is that the drug containers could have been stripped of their labels and the packaging thrown away. The Department of Corrections did not immediately return calls for comment concerning the latest documents that were turned over to Sepulvado’s lawyers. The issue has raised a basic question: If the intent is to kill the prisoner, why would it matter if the drugs are expired? First, technicians performing the procedure run the risk of using drugs that aren’t as effective as they should be, said Dr. William Kirchain, a professor with Xavier University’s College of Pharmacy. Pharmacists don’t use expired drugs because they might not do what they’re supposed to, he said. Ethically, Kirchain says that even if a drug is to be used for death, the same standards would apply. Dr. David Nicholl, a neurologist and human-rights activist, agreed. In 2011, Nicholl filed a petition in the Supreme Court of Florida concerning Nembutal. “Nembutal is not intended to induce surgical anesthesia; should it fail to work effectively in the lethal injection procedure, the prisoner risks suffering a torturous death,” Nicholl said. Aside from the ethical dilemma, the state of Louisiana would be breaking the law if officials allowed the use of expired drugs, said Richard Dieter, the executive director of the Death Penalty Information Center. The same standards apply to inmates on death row, Dieter said. “Even if they are on death row, in prison, you can’t treat them inhumanely,” he said. On the other hand, the chances of most drugs being ineffective soon after the expiration date are low, according to an article in Slate. The article references the Food and Drug Administration’s Shelf Life Extension Program, launched in 1985, which investigated the military’s stockpile of expired drugs. Sepulvado was convicted in 1993 for the 1992 murder of his 6-year-old stepson. According to graphic court documents, Sepulvado hit his stepson over the head with a hammer. The child was then immersed in a scalding bathtub. Sepulvado admitted in court that he hit his stepson with a screwdriver but claimed the scalding was accidental; expert witnesses testified otherwise. “The scalding was so severe that the victim’s skin had been burned away. In addition to the burns, medical examination revealed that the victim had been severely beaten. The victim’s scalp had separated from his skull due to hemorrhaging and bruising,” the document reads. A DeSoto Parish jury convicted Sepulvado of murder and imposed the death penalty in April 1993. Since then, Sepulvado’s lawyers have filed several appeals at the state and federal levels. In his latest federal lawsuit, Sepulvado joined the suit of death-row inmate Jessie Hoffman. Hoffman faulted the state for not providing basic information about the three-drug lethal injection process, and his attorney argued that the three-drug process could be cruel and unusual punishment, violating his constitutional rights. Clements raised the same argument on Sepulvado’s behalf, this time targeting the one-drug process. He said he needed more time and resources to determine if it amounts to cruel and unusual punishment, citing a due-process right. In February, Sepulvado initially won a stay of execution from a federal judge with that argument. However, the 5th Circuit U.S. Court of Appeals overturned Sepulvado’s stay in August, noting that no other appellate court had recognized such due-process claim. “We decline to be the first,” the decision read. The panel of judges, though, put everything on hold and gave Sepulvado’s attorney’s time to appeal. Nonetheless, a state judge issued a Nov. 5 execution date for Sepulvado. The Louisiana Supreme Court overturned that death warrant, saying that the state judge didn’t yet have jurisdiction since the case was still in federal court. Indeed, Sepulvado’s lawyers filed a request with the appeals court, and they are awaiting the response from the court.